Claire Parker’s Year 2 group gets ready to present their website during the Summer 2013 closing multimedia showcase. Photo by NBTB staff. “I wanted to say thank you so much for a fabulous week. I learned so much at NBTB, made great friends, and brought a lot of ideas and new skills back to D.C. You really made me and every other camper get (even more) excited about journalism.” —Claire Parker, Woodrow Wilson High School, Washington, D.C.
NBTB students visit Twitter for a presentation by Karen Wickre, editorial director. Photo by NBTB staff. “Thank you so much for an awesome week at Newsroom by the Bay! It was truly an amazing experience Wednesday by covering the Prop 8 and DOMA court rulings. This will be something I will never forget. I also wanted to thank you for preparing all the field trips and guest speakers. It was really nice to get a new perspective outside of the classroom in the field of journalism.” —Erica Goldhawk, Amador Valley High School, Pleasanton, Calif.
Casey Miller, third from right, pauses for a group photo with the Y2 students who launched the “One Day, One Story” website during NBTB Summer 2013. Photo by NBTB staff. “This year’s camp was one of the most amazing experiences of my life. Thank you so much for that. I met some insanely motivated and interesting people, many of whom changed the way I viewed aspects in life. Overall, crazy cool experience.” —Casey Miller, Campolindo High School, Moraga, Calif. “Newsroom by the Bay gave my daughter … more than just an excellent journalism experience. She has made many lifetime friends from the Bay Area, from other states … and friends from other countries (Pakistan and South Korea).” —Holly Kropschot (parent), Manhattan Beach, Calif.
“Thank you so much for giving me this opportunity to attend Newsroom by the Bay! (A)bove all, I’d have to say the best part of camp was the real reporting we did. Being out in the streets of San Francisco and interviewing strangers is drastically different from just sitting behind a computer and writing. I definitely won’t forget the amazing experiences I’ve had at NBTB anytime soon. Can’t wait to apply for NBTB 2014!” —Elaine Xie, Archbishop Mitty High School, San Jose, Calif.
“Overall, Newsroom by the Bay was an amazing experience that I’ll never forget. For 9 days, 71 people who came from diverse backgrounds and who have diverse passions were brought together by their interest in the field of journalism. I learned so much that I’ll take home to improve my own newspaper but also walked away with new relationships and a new perspective on reporting and the world in general that I’ll always value. I will definitely be recommending this program to others on LHS’s newspaper staff.”—Lexy Medema, senior, Lincoln High School, Sioux Falls, S.D. Rising junior Deron Essex stops to work on a story during a visit to the Asian Art Museum in San Francisco. “On behalf of the other guys and myself, I’d like to thank you both for an amazing week. We’ll bring any lessons back to St. Benedict’s, and our newspaper and its website will be completely different as a result of coming to Newsroom by the Bay. Personally, I can say that here, I’ve found many of the answers I’ve been looking for. I always asked myself after we finished our newspaper and we distributed (it), why kids just kind of didn’t care, and many just threw it out. It hurt me a lot of time to see weeks of hard work, weekends and hours spent during production (end up) on the floor around school or simply in the garbage. Our website barely had any views, and I never knew why …. Coming to NBTB and meeting people … who gave us tools to attract kids, (were) super-energetic and would always challenge my way of thinking about how journalism works today was amazing. I’m sure we learned many, many lessons to make our paper count.”—Telmo DeMorais, senior, St. Benedict’s Preparatory School in Newark, N.J.
Patricia Jia and Ike Shehadeh, the owner of Ike’s Place, a popular sandwich shop at Stanford. 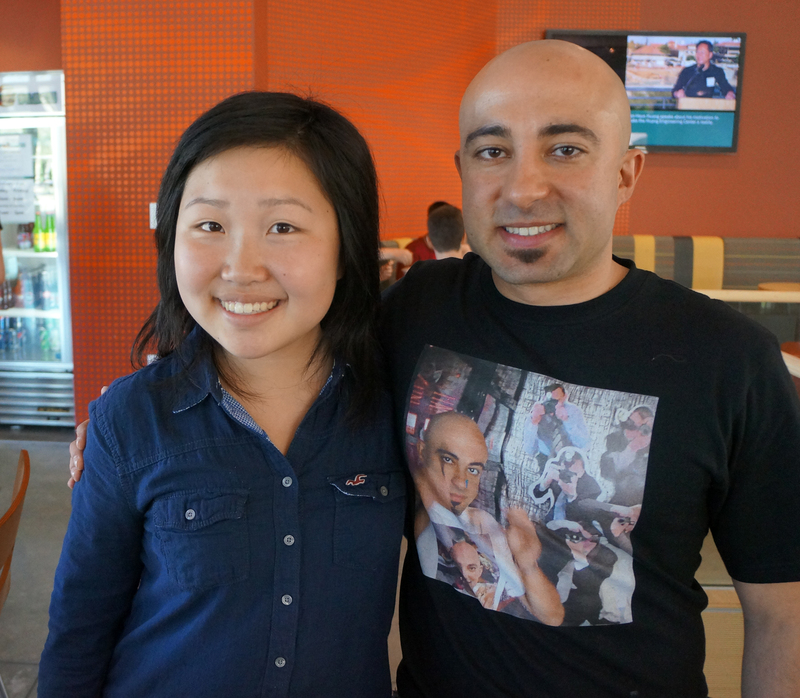 Jia wrote her first-ever restaurant review for her website, The Current. “Thanks again for such a great experience at NBTB! I’ll never forget the crazy week of connecting with editors, hunting for stories in San Francisco, and staying up past midnight with other journalism enthusiasts. Can’t wait to come back next year!”—Patricia Jia, sophomore, St. Francis High School, Fremont, Calif.
“I would just like to express my gratitude to you for all of your hard work and dedication. Your passion and love for all facets of journalism is one of an infectious nature. The amount of knowledge I was able to gain in a short one-week period of time amazed me …. In everyday conversations, I often mention my incredible experience at Stanford University with all of the people from Newsroom by the Bay. I cannot thank you enough for making my dreams a reality. 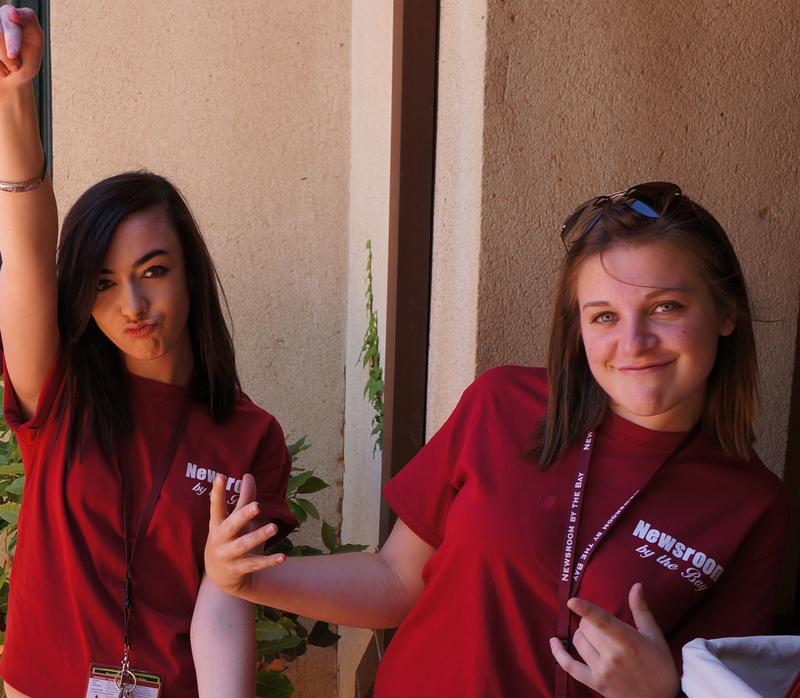 I will never forget you or the things I learned.”—Morgan Skidmore, senior, Olathe South High School, Olathe, Kan.
Teagan Sebba, left, and Mary-Kate Engstrom, right, display the NBTB spirit during check-in last June. 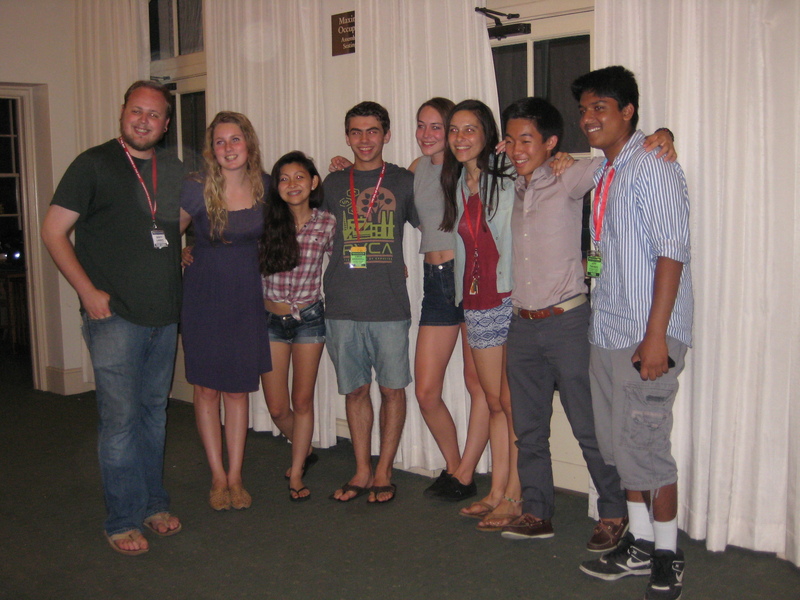 Sebba and Engstrom attended our Summer 2011 session as students and came back in 2012 as counselors. “Thank you so much for a Newsroom by the Bay experience that I will never forget! 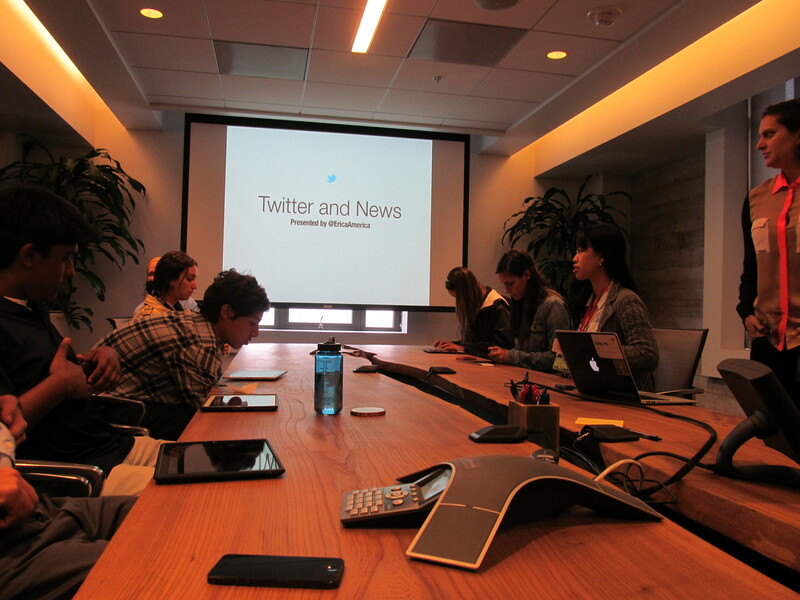 During my 10 days at Stanford, I learned so much about journalism, people and myself. I learned that the friends and connections you make now will impact your life forever, and I’m lucky to have made such great friends and connections at NBTB this year.”—Teagan Sebba, senior, Fort Collins High School, Fort Collins, Colo.